Saving the World One Nail at a Time: Polish Me To Go's Glow Polish! Today I am pleased to bring you swatches of Polish Me To Go's glowing nail polish! 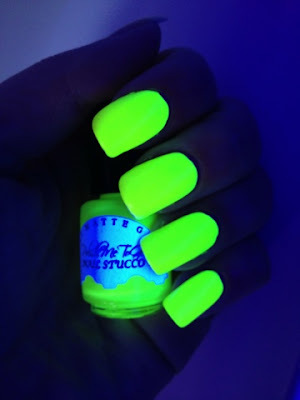 I have seen a few glow in the dark polishes before but these are on a whole new level! I started with Honey My Dew from her pastel spring glow line. This is a very creamy opaque formula. The polish was a little thick but you get great coverage! I used two coats but it didn't really need the second. You can wear this polish on its own without any under color. In the light of day it appears a creamsicle orange. 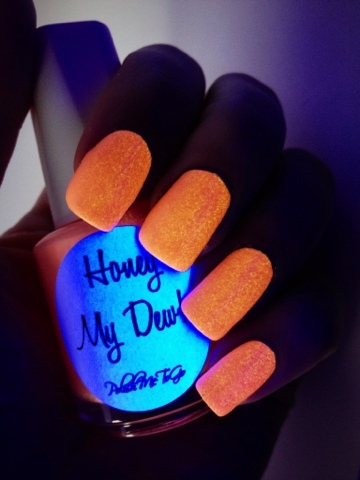 Under black light this polish immediately lights up a brilliant orange. So fun for going to concerts or parties! I charged this polish for 30 seconds by holding it under a UV grow lamp for plants to simulate sunlight. 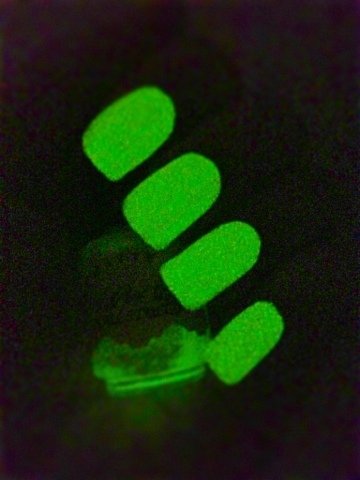 In the dark this polish glowed so bright! The glow pigments are a mix of yellow and orange which you can see in the dark and actually gives a very nice effect! My next Polish Me To Go polish was Pretty Girls, a neon pink glow polish from her neon line. This is a sheer neon color, it looks exactly like a pink highlighter color does. This one needs a white base to get the full color but it can also be used over other colors and polishes. The formula was amazingly smooth and easy to apply on this one. I used one coat of Polish Me To Go's white undie color and two coats of Pretty Girls. 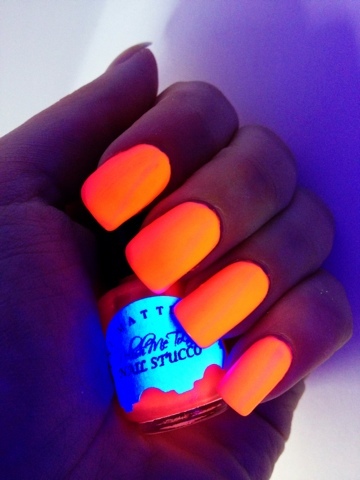 In black light this polish glowed neon pink immediately. My camera couldn't pick up the actual hot pink glow and changed it more to an orange, but rest assured you will have hot Barbie pink glowing nails with this. This polish did not have the same boom in the dark that Honey My Dew did. It glowed pink but much fainter than the pastel orange did. Still this was a great polish in black light and an amazing hot pink on its own. Finally is Sunny Days.This is a neon high lighter yellow from Polish Me To Go's neon line. Just like Pretty Girls this polish had a smooth easy formula and application. I used two coats of white undie color and two coats of Sunny Days. Under black light this polish is AMAZING. The color is so bright and so neon it almost hurts to look at! 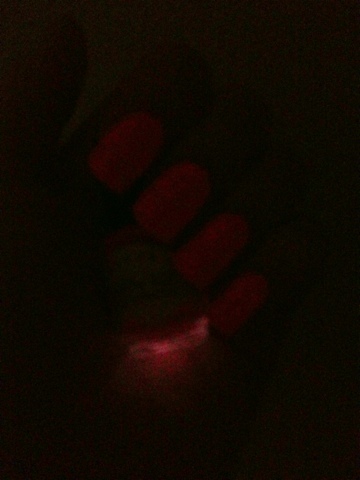 Similarly when charged under a lamp for 30 seconds and left in the dark and equally bright glow emits from this polish. This polish was bright and glowy all across the board! To show some of the versatility of this polish I used Polish Me To Go's white undie as a base in two coats and then hand painted some drip nails with Honey My Dew, Sunny Days and Pretty Girls. In the day they are cool but under black light they come alive with vibrant glowing neon colors. I am very excited with Polish Me To Go's glowing polishes and can't wait to see what she's bringing to the near future. 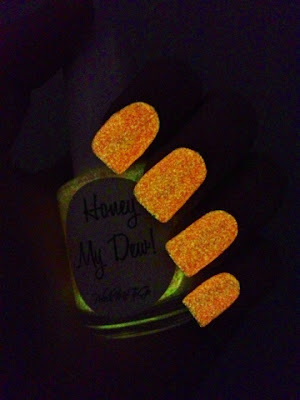 Honey My Dew and Sunny Days were both amazing glow polishes while Pretty Girls was a nice formula but didn't deliver as strongly as the other two. 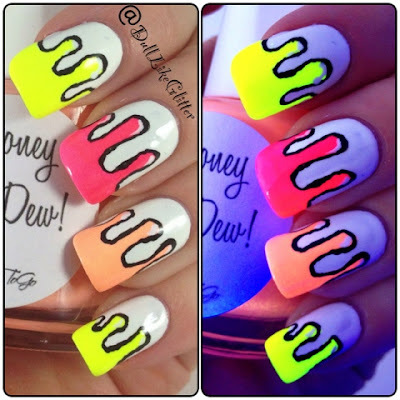 Check them out below glowing under black light and in the dark!